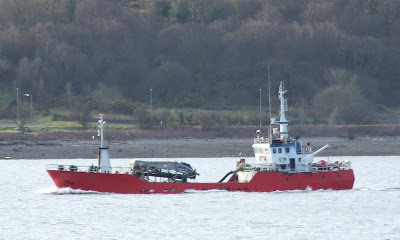 Although live fish carriers are common sights on other parts of the Clyde, it is comparatively unusual to see one as far upfirth as Cloch Point, where AQUA-BOY was seen passing this morning. She was heading for King George V Dock in Glasgow, possibly to load a cargo of salmon smolts, and she sailed again this evening for Loch Duart in Sutherland. AQUA-BOY is Norwegian owned, and was built in 1982 as PEER GYNT, later becoming ANTONSEN SENIOR in 1985, then KONKURS 1 in 1987. She was given her current name in 1988. She is 39.65 metres long, and has a gross tonnage of 312 tons. AQUA-BOY was in the news in November 2006, following a grounding in the Sound of Mull, and became the subject of an inquiry by the Marine Accident Investigation Branch. Other views of AQUA-BOY can be seen here as she passed Greenock.